There used to be an Asian shop in Seattle called House of Rice, located in the University District (the neighborhood surrounding the University of Washington). House of Rice was on the south end of “The Ave“, a fun street filled with funky shops and restaurants. Soon after my family moved back to Seattle in the late 1970’s, my Mom took some Chinese cooking classes at House of Rice. She learned how to make won tons, won ton soup, and fried rice, among other things. Throughout my childhood she made these dishes on a regular basis, and my family still uses the fried rice recipe as our go-to recipe. It’s been years since I’ve had the won tons, but they are so good (but time-consuming to make). When I was in high school I had to take the city bus to get home in the afternoon. One of the routes I took left me with a 20 – 30 minute wait in the University District. I often made quick jaunts out to shops on The Ave, Tower Records being one of my favorite stops (back when it was filled with vinyl records and cassette tapes!). Another of my favorite stops was House of Rice. I loved looking at the exotic Chinese and Asian goods. There were food items, dishes, cookware, and all sorts of other trinkets and decor. When I was a little older and ready to buy my first wok, House of Rice is where I went. Certain smells, particularly Chinese five spice powder, always take me back to that store! All that remains of House of Rice now are memories and copies of those recipes. I made the fried rice recently and was reminded of just how good it is. Have all the ingredients prepared before starting. To prepare the mushrooms, place them in a heat-proof bowl and pour boiling water over to cover. Soak until mushrooms are soft, about 20 minutes. Drain the mushrooms, remove the tough stem, and slice. Heat the oil in a wok or large skillet over medium-high to high heat. When hot, add the beaten eggs and stir-fry until set. Add the barbecued pork, mushrooms, and bean sprouts and stir-fry for an additional minute. Add the rice to the wok or pan. Break it apart with a spatula and stir-fry until rice is heated through, at least 5 minutes. Add the green onions and soy sauce. Stir to mix thoroughly. Taste for salt; add salt or more soy sauce if needed. I knew I was going to like this week’s French Fridays with Dorie recipe before I even made it. You just can’t go wrong with the words “creamy, cheesy, and garlicky” in the title. This dish is very, very similar to risotto. Both call for Arborio rice. The biggest difference (to me) is the cooking method. With risotto, the broth (and often a little wine) is added to the rice a little at a time, while the cook stirs constantly for 20 to 30 minutes. For this creamy dish, the rice is cooked more like traditional rice in a covered pot. The aromatics and spinach are cooked separately and stirred into the finished rice, along with some cheese (I used Gruyère) and heavy cream. I really liked the less-intense method of preparation for this rice. The end result was just as creamy and satisfying as a dish of risotto. Oh my, this was good! I couldn’t stop taking spoonfuls out of the pot while serving it up. It was deliciously rich and flavorful. My husband made an interesting observation the night we at this. He has mixed feelings about my “experimental French recipes”, but he noted that his favorite ones are the least “French”. The Creamy, Cheesy, Garlicky Rice with Spinach is one that he liked, and I will definitely be making it again. I apologize for the uninspired photo… I almost forgot to take it, and I was out of daylight, so I just snapped a quick picture before digging in! One of my favorite food bloggers, Pam over at Sidewalk Shoes, loves Mark Bittman. I had never heard of Mark Bittman before reading her blog, but I was intrigued. When Pam recently hosted a giveaway for Bittman’s iPhone /iPad apps called “How To Cook Everything” (based on his cookbook How To Cook Everything) I jumped on it. Guess who won the iPad app? Lucky me! Fast forward to Thursday night. 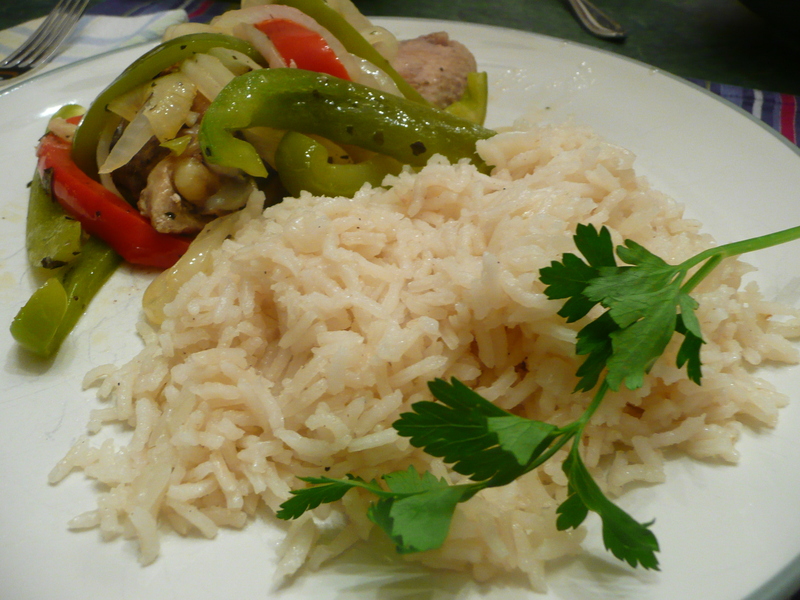 While I was working on the evening’s main course, I decided we needed a rice dish on the side. The dish suggested by my cookbook was a little too involved nor did I have all the ingredients. I wanted something quick and simple to put together, but not plain white rice. Really, I just wanted a basic rice pilaf. I’m sure I could have come up with something on my own, but I didn’t want to. I wanted to be spoon-fed. I also didn’t have time to search through my cookbooks for a suitable recipe. What’s a semi-lazy, pressed-for-time cook to do? Aha! My iPad app! Surely something called “How to Cook Everything” would have a recipe for rice pilaf. I launched the app, did a quick search, and a minute later had the perfect recipe. 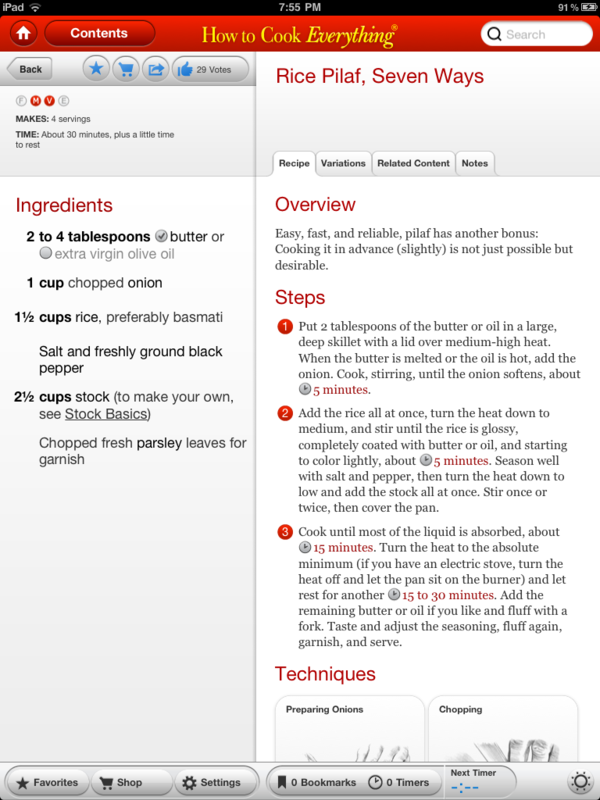 The recipe provides several variations. I stuck with the main version, but I was very tempted by the “Vermicelli Pilaf” variation. There are a couple of Mexican-themed versions that look interesting as well. I had one beef with the recipe. After the onions are sauteed and the rice is added, the recipe instructs you to turn the heat down to low and then add the broth. I found that the broth was not hot enough to really cook the rice with this method. I turned the heat up until the broth began to simmer, and then I turned it down to low. Otherwise, great recipe and just what I was looking for! Now for the coincidence part of this story… This is my first Mark Bittman recipe, and the very day this story occurred, Pam was (still is) hosting a Mark Bittman blog hop over at her site! So, I have decided to participate. This post will be my first entry into the Tackling Bittman Recipe Hop. Put the butter or oil in a deep skillet or pot (one with a tight-fitting lid) over medium-high heat. When the butter is melted or the oil is hot, add the onion and cook, stirring, until the onion softens, about 5 minutes. Add the rice all at once and turn the heat down to medium. Stir until the rice is coated with the butter or oil and starting to brown lightly, about 5 minutes. Season well with salt and pepper. Add the stock and bring to a simmer, stirring once or twice. Cover the pan and reduce the heat to low. Cook until most of the liquid is absorbed, about 15 minutes. Turn off the heat (but leave the pan on the burner) and let the rice rest for another 15 to 30 minutes. Fluff with a fork before adjusting the seasonings to taste, garnishing, and serving.